(…)Keli is an alias used by Yukiko Fukushima, a Japanese artist who is as active in photography as she is in music. 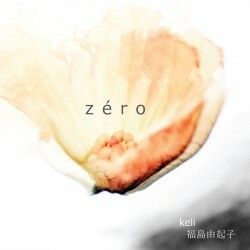 Her album Zéro carries many of those Asian aesthetics that make Eastern art so special and precious. The music can be easily placed somewhere between ambient and drone, but the way it’s structured and approached has a very complex and gradual touch, highly reminiscent of modern classical music. Keli’s existence in the world of music looks somehow modest and gentle, if not pretension-free. Her music is more of an experiment than a bold statement, yet perfectly accomplished. Yukiko Fukushima’s ambient has to be heard multiple times in different scenarios, whether it be a time when the listener is extremely focused on the music or simply let it be a soundtrack to whatever activities fill their daily routine or lifestyle. Zéro is carrying love, loneliness and endless curiosity; it is a sonic exploration, a free-form artistic endeavor (no matter whatever genre labels one might be using). Walking the borderline between styles while at the same time remaining specific and charming, Zéro is a product of an artist who isn’t afraid to experience and share her sources of inspiration. While playing the album I was constantly wondering one thing: why this title? Throughout the track list, Fukushima shares with us all the elements of the world, but only her own interpretations of them. And the sum of all that is definitely not a zero, but rather something so immense and immersive that you start wondering how an album with music so fragile and delicate was able to unify all of these strong and massive symbols. Zéro morphs from breath-like ambience to clean and hypnotic melodies which are based on acoustic instruments (or their digital alternatives), synthesizers, transparent pads and thick drones. Sometimes you can hear orchestral fragments intertwined with immense drone waves, eventually evolving into something that is dipped in reverb and surreal. Zéro is like a grandiose soundtrack to the Earth, but experienced through the honest and curious eyes of a crafty artist with a primal, yet skillful approach.